MUA: Undress Me Too Palette / Gee Whiskers! I recently order a few products from the Makeup Academy and one of the products I ordered was the Undress Me Too palette of eye shadows. 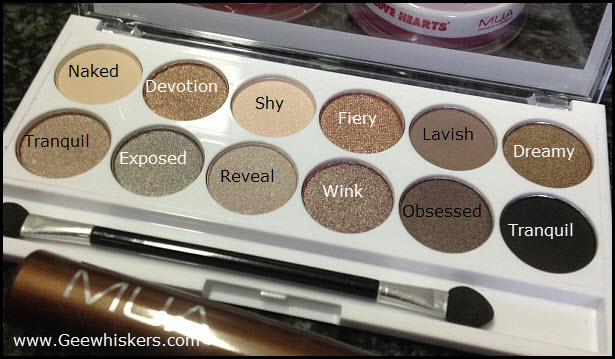 The palette has 12 varying shades of brown and natural toned eye shadows. The palette has a mixture of matte and shimmer eyeshadows that allow you to create lots of different looks. The eyeshadow lasts incredibly well throughout the day. These eyeshadows are wonderfully pigmented so they can be built up to create a day night time look or you can go more natural for a beautifully soft day time look. The best part, this palette only cost me 4 pounds (GBP). Ordering from MUA is very quick and easy. They ship to South African post offices at a cost of 7.50 pounds. It took 10 days to arrive and all the items I ordered came bubble wrapped. I was a little worried that with the travel the products might be damaged, but everything was in good order. Follow MakeUp Academy Cosmetics on Twitter and Facebook. It is so amazing! Really have fun with the different shades. And it was such a bargain! It currently is the only palette I use everyday. I love it! Love the photo! It looks gorgeous. I just ordered the Stila Written in the Stars palette, also neutral colors. I will do a review on it soon! This palette sounds amazing and the shades look really great on your eyes. Looks amazing :) (and, I finally found it ;) I orders from them, but I ordered the WRONG one. When i contacted them again they said I could not change or cancel an order sooooo basically I'm hoping that one is ok. I love the look you did, it's really both dramatic and not too out-there.